Masters swimmer and regular ASA volunteer Claire Thorn fills us in on her latest swimming challenge, a two-way Channel relay, and her preparation for the event. 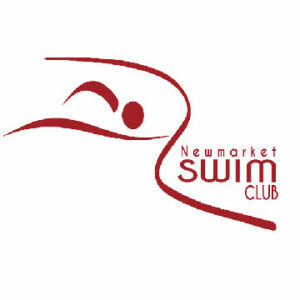 2swim4life – the first challenge! It took me less than a nanosecond to say yes! The English Channel is on my bucket list and although I know I do not have the time to dedicate to training for a solo attempt, I had always wanted to be part of a relay swim. So by December 2014 the team had been decided on. 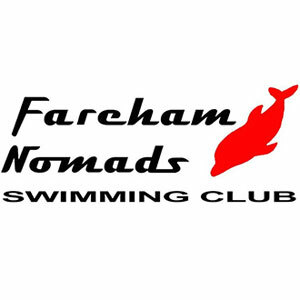 Paul and I would be joined by Ross Emery, Charlie Weldon, Stuart Fuller and Rob Small and our two-way relay swim was booked and scheduled for July 2016. This gives us (me!) plenty of time to train and to acclimatise to the cold water. We decided that along the way we would complete many swimming challenges and raise as much money as possible to Macmillan Cancer Care. 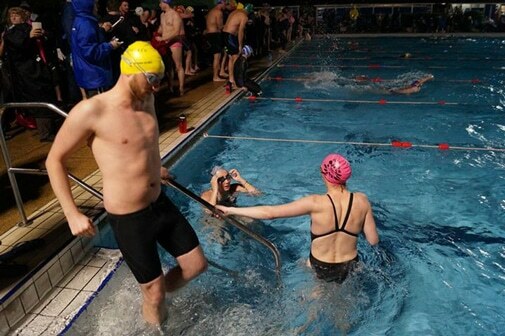 So, first on our list of challenges was the 2swim4life – a 24-hour swim challenge raising money for Place2Be, a charity that helps families of children with mental health problems. To be honest, out of all the challenges we are doing this was by far the last on my list and if the others had not signed up for it I would have stayed well away. Why? I knew that I was physically fit, but swimming through the cold night, getting in and out of the cold water was not my idea of fun. I did no special training for this event and as the day drew closer I became a little nervous that I was a little underprepared. Reading e-mails and Facebook entries leading up to it made it even worse but I was swimming in a two-person team with Paul and I simply couldn’t let him down. 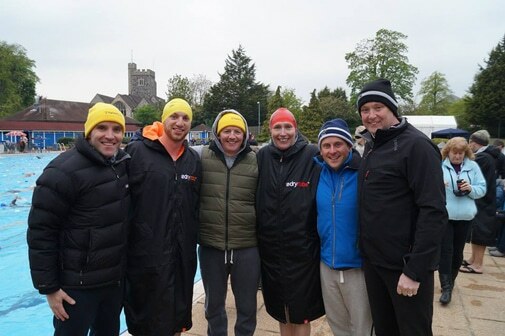 2swim4life took place at Guildford Lido, a beautiful facility with a clean 50-metre outdoor pool and large grassy area surround. 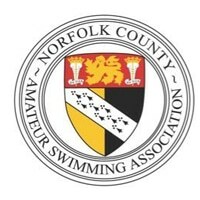 Three hundred and fifty swimmers took part with 67 solo swimmers and 47 teams. 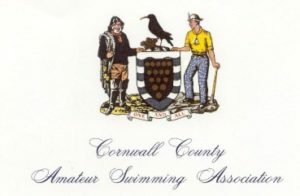 Each soloist/relay must swim 1 mile every hour for 24 hours starting at 9.30 am on Saturday 2 May. My primary goal was to complete my 12 miles and to help Paul complete his and if possible not to don my wetsuit (but I had it with me, just in case). Also taking part in two-person team was Charlie/Ross & Stuart/Steve (Dunn – a substitute for Rob who is currently overseas). The lads had pitched a large tent the night before where we could change and rest between swims – I soon discovered that there was no time for rest and the sleeping bag I had brought stayed firmly in its cover the whole time! I am cold already! The water temperature was allegedly 22C, however the cloudy weather was cooling the pool to 20C. Considering your local baths is around 28/9C, it was a little chilly on getting into the water. Prior to getting in, Paul reminded me; this is not a race! I knew that but I am competitive! We were organised into ‘predicated time for a mile’ lanes with 1 the fastest and 10 the slowest … we were in lane 1 along with the other lads, this was a little concerning for me. I set off at a steady pace but couldn’t go too slow as to get too cold. I felt strong and was enjoying my swim, at 750m I said to myself, that’s half way … only to realise several 100m later that it was in fact 1600m and not the 1500m I had been used to in pool racing events. I overtook the other four swimmers in my lane. This was not intentional it just happened. I finished not feeling out of breath and Paul was there with my Dryrobe and said something like, well done Claire that was fast, it’s not a race you know! Ross informed me that I had gone sub 23 minutes, I felt great … one down, only 11 to go! That rest period went quick! After changing into a dry costume, having a hot drink and a little food, it was time to count the laps for the others, Paul, Ross and Steve. I was feeling good in the water and comfortable too. In the lane were Charlie and Stuart who were partnering and Andy and James who were doing the solo! I again overtook the others and had a good swim, this time I went 22:30 which I was pleased with as it felt so comfortable. On exiting the water I went into the heated tent I had discovered to change into a dry costume ready for the next mile, hot drink and to eat I had a golden syrup porridge pot. Spirits were high in our tent and even the sun was trying to push through the clouds. Just prior to getting in for this mile, Pete, Ben and Oliver arrived. It was great to see them. I put Ben in charge of counting laps and Oliver in charge of my camera. While swimming I could see nine-year old Oliver following me up the pool filming and wearing my oversized Dryrobe …. this made me chuckle. Even the sun had come out and the warmth it brought was quite uplifting. On exiting the water, Oliver was keen to show me the photos he had taken. I carried out my usual routine and met the boys back at the tent who were happy to tuck into the Haribo and biscuits. Pete and the boys replenished our hot and cold water supplies and then went off to have some fun. Not long after the boys had gone my friend Sarah arrived with her three children and this cheered me up. The sun was still shining but it began to drizzle. Sarah’s children were cheering me on this mile with their cow bell and it was much appreciated. I still felt strong in the water and was pleased to be a third of the way through the challenge. Another golden syrup porridge pot was consumed, this time a little too much water was added so wasn’t as satisfying as the last but it was warm. Sarah and the kids were gone and so was the sun! With the air temperature dropping it was difficult initially getting into the water but after a length or two, I warmed up. We had a new addition in the lane, Paul Smith, who instead of doing a mile, was doing three miles with his partner. Paul was therefore only on his second mile and felt fresh. He kept with me for a couple of 100m but said himself later that as I was repping around the 1:20 mark he let me go. I anticipated six laps to go so when the lads told me I only had four I was very happy. Stomach trouble kicked in following this mile, which was a concern, and I put this down to the electrolyte stuff I had drunk. From then on I decided to drink nothing other than water and hot drinks. This was another steady mile without any drama. Solo James had been wearing his wetsuit for his last couple of miles but he was on mile 12 now. On finishing …. we’re half way there, living on a prayer! This was a good place to be in! After already having consumed three porridge pots I could take no more! I needed something savoury! It was getting dark! The crowds had gone away and we were down to the serious swimming. As soon as I pushed off I had less than half of the challenge to go. We were down to four in the lane. After completing an amazing 12 miles, James had called it a day. Andy was now wearing his wetsuit which gave him a little boost. The lads counting laps had been giving me the four laps to go sign but in the dark this was difficult to notice they had also moved further up the poolside so when I came out of my turn I didn’t see them, I was anticipating the four laps to go but I couldn’t see them and then there they were. What a relief! During one of Paul’s previous miles, I noticed that there had been a new addition to our lane – a lady in a pink hat who looked rather swift! I thought if she ever goes in my wave I will ask her to lead off and I can draft off her, oh that would be nice. Lining up for this mile there she was, I politely asked her to lead the way … I soon discovered that this had been a mistake, I was swimming very close to her feet and as she was not doing tumble turns I quickly caught her up, however, the only way I was going to overtake was to seriously move up a gear! A few lengths in the situation was annoying me and I sure it was her. Reluctantly I sped up and kept this increased pace for a few 100m in order to get a good 10m plus in front. I was now breathing hard at a time I did not want to and I could feel my body paying the price. 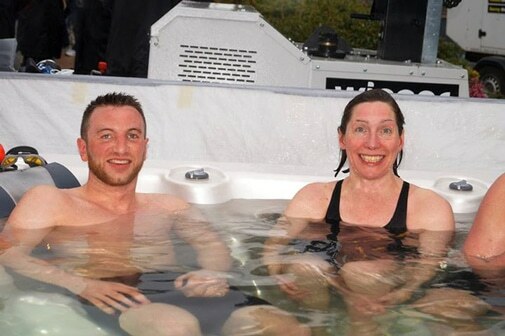 I exited the water and said to Paul that that was not in the plan and I would be paying for that later … I then went into the jacuzzi! It was raining and being in the water was a better place than counting laps on the side! But my exertion in the previous mile was causing my right shoulder problems. On every pull I had a pain, to the point I was concerned about finishing. I still had three miles to go after this one so there was no option but to slow down. I knew I was physically fit but had those early good miles taken more out of my body than I had wanted? The jacuzzi was once again calling! Now this was probably the worst of all the miles. It was still dark, the live music had long gone and it was raining a real damp rain. I was wet in the water I was wet out of the water. Spirits were low all-round and while I was in good spirits when the others were swimming, when it came to us I felt low. I had the same shoulder pain as in the previous mile and I once again concentrated on efficient stroke count and getting through it. The day was breaking and although it was still raining, the thought of only having two miles to go was an amazing one! Shoulder pain remaining the same, but on a positive note not getting any worse, I plodded on one stroke after another … we were going to do this, the worst was over! There was much excitement for our final mile. After a couple of lengths, amazingly my shoulder pain wasn’t as bad … was it all in the head?! Charlie had stepped up his game and it took several 100m to get away from him and on this occasion I did not lap him. He must have been saving himself! It was such a good feeling to have completed the 12 miles! I had the upmost respect for all those solo swimmers who had done the 24 … well done! Pete arrived to take me back to my sister-in-laws where I enjoyed a lovely bath, some proper food and subsequently fell asleep with the boys watching a movie.